Kurlee Belle: What to look for in cleansers, conditioners and curl cremes. What to look for in cleansers, conditioners and curl cremes. Do you care what you put on your hair? Well you should. Here is a simple guide that will help you when searching for products. Cleanser (Shampoo)- Sulfate-free products only please. Ingredients like sodium lauryl sulfate, ammonium laureth sulfate and sodium laureth sulfate should be avoided. 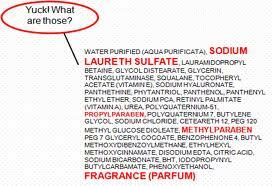 These ingredients are harsh chemicals found in detergents that strip the hair. Would you wash your hair with Tide or Gain? I hope not. Conditioner/ Curl cremes- Look for conditioners that contain emollients, humectants and moisturizers. Products that contain high concentrations of plant based ingredients are a keeper. Emollients soften the hair and reduce frizz. Look for words like shea butter, vegetable oils, olive oil, walnut oil, jojoba oil, cetyl ester and wheat germ. Humectants absorb water and are critical for conditioned hair. Look for words like panthenol, vegetable glycerin and sorbitol. Moisturizers add softness and controls curls. Look for words like amino acids, aloe vera, olive oil, balm mint extracts and propylene glycol. Avoid Silicones: this is a synthetic material that repels water and is not biodegradable. Essentially preventing the hair from absorbing moisture. Please note: Ingredients are listed in order of concentration. The product contains more of the first ingredient listed on the label than the last listed ingredient. Thanks! I will do my best to keep the articles coming.